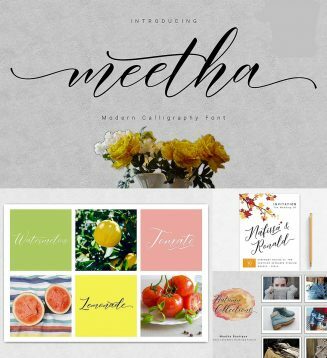 Meetha Script is modern calligraphy script font. This is a beautiful script font with italic style. Made gently and danced to give the character of modern writing that is sweet, simple, stylish and firm. File format: .otf, .ttf, .woff for Photoshop or other software. Tags: elegant font, hand lettered, modern calligraphy, monogram font, script, wedding font.